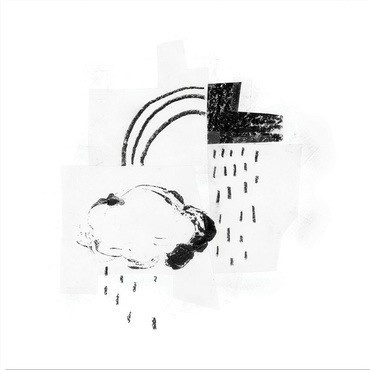 Damien Jurado has always worked fast, but In the Shape of a Storm came together with unprecedented speed. Recorded over the course of two hours one California afternoon, it’s Jurado’s sparsest album to date. Gone are the thundering drums and psychedelic arrangements that defined the trilogy of concept albums he made with his longtime collaborator and close friend Richard Swift. Gone even is the atmospheric air that hovered above his early albums for Sub Pop. Here, there’s only Jurado’s voice, acoustic guitar, and occasional accompaniment from Josh Gordon, playing a high-strung guitar tuned Nashville style, rendering its sound spooky and celestial. Though fans have long requested a solo acoustic album, the prospect never made sense to Jurado, until one day it simply did. “It just felt like it was time,” Jurado says. The idea of an unadorned album became its own medium in his mind, like a painter who sets down his brushes and instead opts for charcoal pencils instead. “There is nothing left to hide,” Jurado sings on Lincoln, which opens the record. It’s something of a thesis statement for these songs. Everything here is clear and laid bare, two- tone, like the drawing Jurado crafted for the record’s cover. Originally written for 2000’s The Ghost of David, Lincoln was shelved and forgotten about until Damien came across it on an old cassette tape. The discovery inspired him to go about gathering up songs that had never found proper homes. As a result, In the Shape of a Storm is like an archive of previously abandoned songs. Damien Jurado’s discography is filled with songs written as miniature movies, cinematic vignettes that capture people, the places they are from, and where they are going. In the Shape of a Storm is his first black and white picture. It’s both a snapshot of two hours in a California recording studio and a document spanning 19 years and a life of music. It is the sound of a singer pouring out possible futures and visions. “I believe songs have their own time and place,” Jurado says. For these ten, that time has finally come.